As I’ve mentioned before in a previous post about reasons for trying heirloom seeds, I love using heirloom seeds in my garden, and my garden is actually exclusively heirlooms now. One of the main reasons why I love heirloom seeds is because I love history and I find it really exciting to be able to taste the same varieties of vegetables that were grown in previous centuries. And another reason why I love heirlooms so much is because you can save your own seeds to plant again the next year unlike with hybrid seeds. And another great thing about heirloom seeds is that you can try so many really unique and interesting varieties of vegetables that you’ll never find in a grocery store or even at most farm stands. 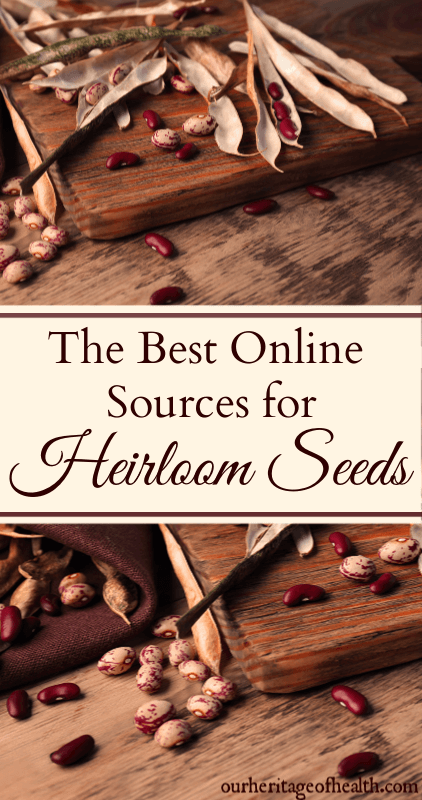 That’s where this list came from actually, because I’ve done a LOT of online researching in the past to find specific hard-to-find heirloom varieties and along the way I discovered a lot of really great heirloom seed sources. And now I want to share them with you! Note: While all of these companies offer heirloom seeds, a few of them also offer hybrid seeds as well so they are not all exclusively heirloom seeds. And while hybrid seeds aren’t my personal preference because I love heirlooms, hybrid seeds are NOT the same as GMO seeds. So hybrid seeds can still be a perfectly good choice if you want a natural and non-GMO garden. SeedsNOW! is one of the places I recommend most often to beginner gardeners because they have a lot of guides and information to help beginners decide which type of seeds will do the best in their particular garden, how to plant and care for the seeds, etc. Focuses on rare heirloom, open-pollinated seeds but because of the variety of growers involved in the Exchange, seeds aren’t all certified non-GMO. Seed Savers Exchange is a bit different from the typical online seed company. Seed Savers Exchange has a large seed bank dedicated to preserving heirloom varieties of seeds, and their collection comes from hundreds of backyard gardeners with seeds that have been passed down through the generations. Seed Savers Exchange offers you two options for finding seeds. First, you can vising the “Shop” section where you can find a small selection of interesting heirloom varieties to buy directly from their website. Or, you can create a free account and visit the “Exchange” section to find a HUGE selection of heirloom seeds from gardeners all across the country. If there’s a rare or hard to find variety that you’ve been looking for, there’s a very good change that you might be able to find someone on the exchange listing those seeds for sale! Victory Seeds is a small, family-run company that offers a good selection of old-fashioned heirloom seeds. One thing that I really appreciate about Victory Seeds is the historical information that they offer in the descriptions for many of their seed varieties. As someone who loves history, I’m always looking to find the historical details about heirloom seed varieties and it drives me a little bit crazy when seed companies give just a vague description with no reference at all to the historical background of the seeds. So I love the fact that Victory Seeds makes the effort to give that information when it’s available. The Monticello Seed Shop offers the same varieties of seeds that would have been historically correct for the period when Thomas Jefferson was planting his gardens at his Monticello home. While the selection of seeds available is much smaller than what you would find on a typical online seed store, the Monticello Seed Shop is the perfect place for history lovers to find unique early American seed varieties. Johnny’s Selected Seeds is a 100% employee-owned company that offers a wide variety of vegetable, herb, and flower seeds, and they also offer some live plants too. They do offer some hybrid seeds as well as heirlooms, so if you are looking exclusively for heirloom seeds then you’ll have to do some sifting through their website to find the heirlooms. But if you know specific varieties that you want then it’s worth checking them out because they have a large selection of seeds to choose from. They’re also a good option if you want to plant organic seeds because many of their seeds are Certified Organic. Fedco Seeds is a bit different than the usual seed company because they are a cooperative so profit isn’t their main goal. They offer a wide variety of seeds that you can get either in small amounts or in bulk. While they offer hybrid seeds as well as heirloom seeds, they do have a category on their seed page that allows you to browse just the heirloom seeds. You can also browse though just the organic seeds as well, so the way their website is designed makes it easy to search for what you want. The Territorial Seed Company is a family-owned company that offers a large selection of vegetable, herb and flower seeds, and they also offer some live plants as well. 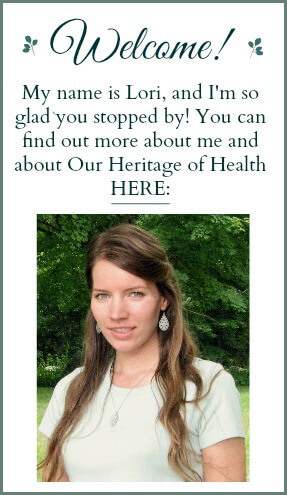 They do sell both heirloom and hybrid seeds, but they way their website is organized makes it easy to find the heirlooms. 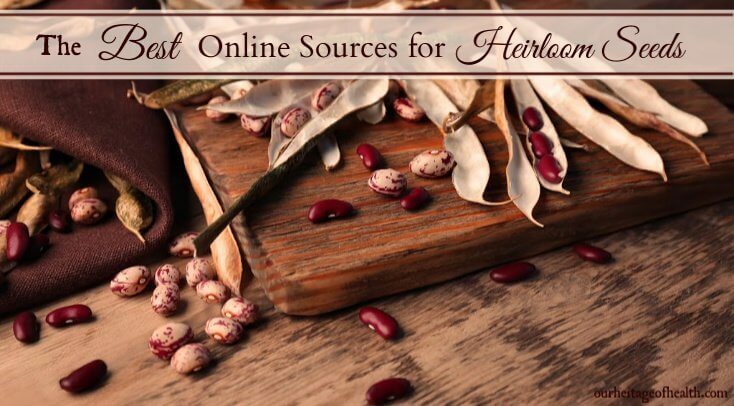 They also have a page just for the varieties that are organic as well, so you can easily find those specific varieties without having to search too much. Want Even More Seed Options?